DENVER, April 7, 2017 /PRNewswire/ -- DaVita Kidney Care, a division of DaVita Inc. (NYSE: DVA) and a leading provider of kidney care services in the United States, joins the effort with the World Health Organization to address depression on World Health Day by providing patients with helpful tips on how to emotionally cope with chronic kidney disease (CKD). 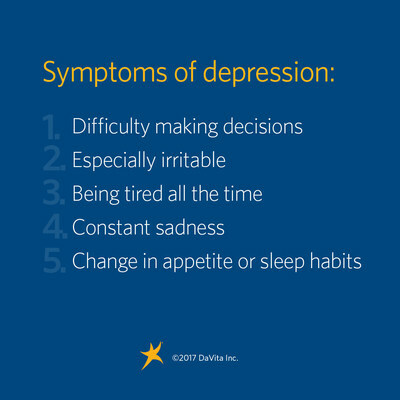 Research has shown depression is the most common psychological disorder among end-stage renal disease (ESRD) patients. If left untreated, depression may lead to a complication of health conditions, reduced quality of life and increased risk of mortality. Patients are encouraged to first speak to their family members, friends and social worker or doctor. Confiding in others may ultimately help save lives. "Patients face challenging emotional obstacles when diagnosed with any chronic disease. However, they are not alone on this journey," said Duane Dunn, director of social work services at DaVita. "Dialysis patients can overcome difficult circumstances with the help of their health care team and loved ones not only on World Health Day, but at any time." In the case of someone who has recently been diagnosed with CKD, strong emotions may be triggered as he or she processes their new reality. Engaging in meaningful activity and socialization may ease the adjustment to dialysis. Patients should turn to health care professionals or trusted caregivers to discuss ways to cope with depression symptoms which may include fatigue, issues with sleep, difficulty concentrating and poor appetite. The Centers for Medicare & Medicaid Services provides an annual screening for depression for Medicare beneficiaries and DaVita social workers screen patients twice a year. Patients and caregivers can receive valuable online resources on myDaVita.com which includes a short risk quiz to help determine an individual's risk for kidney disease, kidney-friendly recipes and an online social community. DaVita provides no-cost kidney education classes to educate those who have CKD, as well as those who want to learn about making the right choices for their kidney health and loved ones of those affected the disease. These classes are open to the community and can be taken online or in-person. DaVita Inc., a Fortune 500® company, is the parent company of DaVita Kidney Care and HealthCare Partners, a DaVita Medical Group. DaVita Kidney Care is a leading provider of kidney care in the United States, delivering dialysis services to patients with chronic kidney failure and end stage renal disease. As of December 31, 2016, DaVita Kidney Care operated or provided administrative services at 2,350 out patient dialysis centers located in the United States serving approximately 188,000 patients. The company also operated 154 outpatient dialysis centers located in 11 countries outside the United States. HealthCare Partners manages and operates medical groups and affiliated physician networks in California, Nevada, New Mexico, Florida, Colorado and Washington in its pursuit to deliver excellent-quality health care in a dignified and compassionate manner. As of December 31, 2016, HealthCare Partners provided integrated care management for approximately 749,000 patients. For more information, please visit DaVita.com/about.